You may recognise Sian as the Training and Behaviour expert from BBC2 show Me and My Dog, where her unique combination of training and behaviour knowledge, innovative training ideas, and supportive and warm-hearted manner helped all the participants build such wonderful relationships with their dogs, and to achieve things they would never have dreamed of at the start. This is the same philosophy we apply at Developing Dogs. You may also recognise her voice from her regular contributions to BBC Radio Cambridgeshire, and other local BBC Radio stations, where she’s called upon to discuss everything from a review of the day’s papers to commenting on specific dog-related stories. Sian also contributes to local and national newspaper and magazine articles about dogs, dog training, and how to live with dogs in harmony. Most recently she has been talking Dog Parkour with the Radio Times, given advice on how to better work with your dog to the Daily Mail, and filmed a piece to be broadcast in the autumn for The One Show on BBC1. Sian has also been an expert consultant on other BBC programmes including Bang Goes the Theory and Inside the Animal Mind. You can see Sian and her dog Riley on part of Bang Goes the Theory here. Sian’s first book No Walks? No Worries! for owners and dogs coping with periods of restricted exercise because of illness, behaviour problems or old age is also available . The book has been reviewed as ”one of the most important dog care books to appear for a long time” by Prof Daniel S. Mills BVSc PhD CBiol FSB FHEA CCAB Dip ECAWBM(BM) MRCVS European & RCVS Recognised Specialist in Veterinary Behavioural Medicine. Sian is also a regular ‘guest trainer’ at venues across the UK giving a talks, seminars, and workshops on a range of topics and sharing her ideas and values with owners, trainers and behaviourists. Sian has a love of communicating, excellent practical skills and up to date theoretical knowledge. 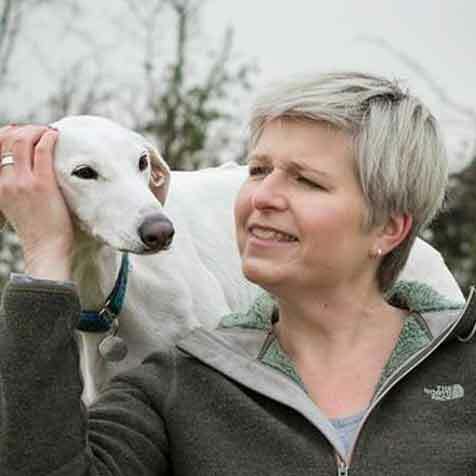 She passed her MSc in Clinical Animal Behaviour from the University of Lincoln with distinction and is a member of the Association of Pet Dog Trainers, UK where she passed her membership assessment with full marks.